I eat eggs every morning, workout day or not. 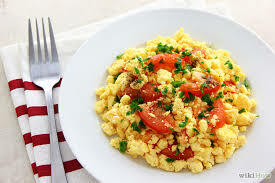 One of the benefits of eggs is the abundance of BCAA’s or branched chain amino acids. Many of the foods we eat on a daily basis provide BCAA’s, leucine, iso-leucine and valine, three of the eight essential amino acids that the body can only get from food. Why is that important? These three proteins are what the human body uses to fuel your muscles. When you stress your type II/fast twitch muscles to move heavy weights signals are sent out to find more proteins and if they are not available in the bloodstream the body will go into a catabolic state and break the proteins down from lean muscle mass, in effect using the muscles of the right hand to feed the left. This is not ideal. By precharging my system with the necessary fuels and promptly recharging with a good dose of protein after my workout, say around 20 or 30 grams, I set myself up for optimal recovery and dodge the unwanted effects of catabolism. An overall healthy diet is the best exercise you can do, it prepares you from the ground up every day. Food is fuel, the better the fuel, the more power you can get out of it.